God’s proof of love for us is found in the scarred hands of Jesus. I often try to hide my scars. Some of them are physical, many are emotional. We tend to hide what we don’t want people to see in us during first impressions. Especially if we really like the person we are with. We hide under bulky clothing, hair over our face, makeup, shrinking so we don’t seem as tall. Because we may be scarred from the words of those we encountered before…who wounded instead of accepting us for who we are. Imperfect creations of the perfect Creator. We have fallen into the world’s belief that scars mar the goods and make them worthless. Jesus’ hands and side might have marred Him physically, and wounded Him on all levels, but they didn’t make Him worthless. They expressed just how much He valued us, those scars. Each welt- an I love you demonstrated for all to see. Each thorn- a reminder of His purpose, to set us free. Each piercing- overwhelming His heart with His plan, our redemption. I find it fascinating that when Jesus rose again, His hands & feet still bear the scars of His sacrifice. Scars meant for destruction became declarations of freedom. Some I continue to try and hide away, but i no longer have the same sense of fear to keep them hidden. I am waiting for His timing, and His loving words to draw me in, to touch my scars and make them beautiful with hope and possibility. Where Love sees the whole person, not the marring of their scars. One day, I will see His beautiful scars up close. An eternal reminder of how much He loves each and every one of us…enough to inscribe us in the palm of His hands. I believe He will see me as the pure spotless bride He calls me to be, scars, flaws and all. Scars remind us to never forget: where we came from, and who is bringing us Home. His scars? 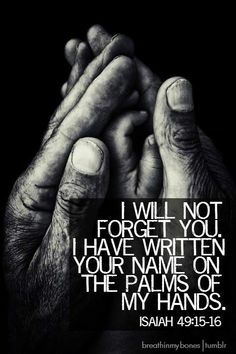 that Jesus will never forget us, nor does He want to. Scars are part of His plan. Beautiful post, very touching and poignant. I am trying to be more vulnerable and open and step away from keeping everything safely hidden behind a wall of ‘okay-ness’ and achievement. It’s a wonderful encouragement to see how this isn’t just honest and true, but also following Christ’s example. Thank you for sharing your story, glad mine could touch yours!